Like many, when I heard the news about Robin Williams’ suicide I had a pause. This naturally brings up a surprise and sadness and feels like a loss for so many of us whose lives he filled with laughter through his personality and amazing talent. Suicide is one of life’s paradoxes just as happiness and sadness are. We are all faced with these extreme feelings at one time or another in our lives. Life is a paradox, which cannot exist without highs and lows, happiness and sadness. Life cannot exist without the polarity of the opposites. To come out of the paradox of life’s ups and downs we must understand the inevitability of our contradictory feelings, dis-identify from them, and make friends with them. We must be watchful and aware, knowing that if we are feeling happy and high, the lows will be waiting around the corner as a shadow that follows our happiness. Another point to consider is that when we swing from one side of the pendulum to the other without having a resting place in the middle our spirit gets tired and longs for rest and peace. This is what meditation and spiritual work help us do. However, when someone is not accustomed to finding this silent inner place inside and keeps swinging back and forth to the opposite side of the pendulum, suicidal thoughts become inevitable. At this point the person is really tired and deeply depressed. He has missed seeing that life is just an opportunity for him to learn his lessons and become conscious of his true being. In my view, suicide is not a mental illness; it is an indication that the person has not found their true inner stillness and peace. Anyone who is capable of feeling the pain and sadness that this earth is surrounded with cannot avoid but to think of the meaninglessness of life and naturally contemplate escaping from its harshness. Unaware of the eternal stillness that can only be found within the unmoving center of his being at any time, in the middle of the chaos of the world and his own mind, he tries to escape from life’s challenges and his own mind to find some peace. There are more people on the planet today who are feeling depressed than ever before. To me, this shows that we have more intelligent people on the planet now than ever before who recognize that something fundamental is missing in their lives. Only the most sensitive and intelligent people will ever think of suicide. Sadly and unfortunately, they are missing a fundamental understanding that life is but a temporary school where we all come to learn and transform what is unconscious in us into consciousness. In other words, we come here to heal into consciousness! The pain of seeing how fleeting everything is in life (fame, success, youth, and even love) affects each person differently. Each person handles life’s ups and downs and the many disappointments of loosing what they have been attached to and identified with differently. Various forms of suicidal thoughts happen to many people at one time or another throughout their lives. Some people think about it and some act upon it. I have personally thought of suicide many times when I was younger. But, I also knew that I will not act upon it. What saved me from eventually committing suicide was the need to understand why I was feeling the way I was and the need to know my true Self. As we become more sophisticated and more intelligent as a species, we must teach our children early on about the temporariness of life and give them a true perspective that we are all mortals and are here only for a limited time. We need to teach them that death is inevitable, and therefore they must make the best out of their lives while they are visiting here and not to take anything for granted. With this new kind of education we can help our children make the most creative choices in their lives and fearlessly live their own unique gifts. We must teach our children to look inside and ask who they truly are, what they are doing there, and where they will go when they die. To me, this is the only way that we can avoid a mass suicide of the most intelligent people on the planet and can transform rampant depression into rampant celebration of life! 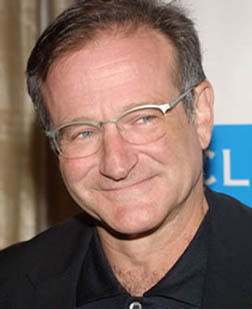 In my view, Robin Williams has given a big gift to humanity by taking his own life. He has certainly awoken a sleeping giant. Hopefully humanity and their so-called experts will be smart enough and humble enough not to try and fix this existential symptom of depression and suicide with the outdated tools, which were created by the old socio-religious conditionings. If we want true change we must stop sustaining the old structures of education and stop labeling people, which do not fit into the norm. We must stop feeding our children our own fear and ignorance and have the courage to face and transform our fear of death and the unknown.